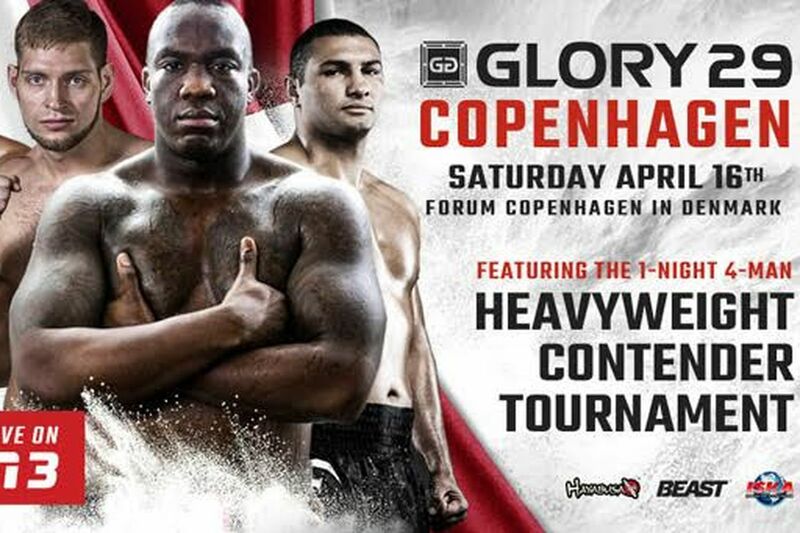 On Sat., April 16, 2016 GLORY will return to Europe for GLORY 29 at Forum Copenhagen in Copenhagen, Denmark. The five-fight main card will be headlined by a welterweight title bout between current champion, Nieky Holzken (88-11) and No. 3-ranked contender, Yoann Kongolo (61-6). GLORY 29 Copenhagen airs live on ESPN3, Saturday, April 16 at 4 p.m. ET / 1 p.m. PT, with a replay in primetime that evening on ESPN2 at 9 p.m. ET / 6 p.m. PT. The event will also air on ESPN Deportes at 7 p.m. ET / 4 p.m. PT on Saturday, April 30, 2016. The world’s leading kickboxing promotion announced the final participant for the one-night four-man heavyweight “Contender” tournament earlier this week. 25-year old Russian prospect Kirill Kornilov (7-1) will be making his GLORY debut when he takes on No. 2-ranked veteran, Jahfar Wilnis in the semifinals. In the other semifinal bracket, Ismael “Mr. Pain” Londt (36-6-1), will also be stepping into the GLORY ring for the first time. He is pitted against No. 4-ranked, Anderson “Braddock” Silva (39-13-1). In addition to the tournament and headliner, the co-main event features a lightweight contest between Niclas Larsen (40-7-1) and Mohammed El-Mir (113-21-0). The GLORY 29 Superfight Series will feature a light heavyweight bout between Zack Mwekassa (13-3) and Zinedine Hameur-Lain (54-12). GLORY 29 SuperFight Series airs live on UFC FIGHT PASS, Saturday, April 16 at 1:30 p.m. ET / 10:30 a.m PT.